Designed to be used as a maintenance and preventative solution this unique formulation is highly concentrated and is safe to use with fish, mammals and in aquariums. as sweat and urine. Other phosphates sources are detergents, some insecticides, soft drinks, toothpaste and even some pool chemicals. chlorination and / or the addition of a Lo-Chlor Algaecide), this organically bound phosphate will be released into the water. Add STARVER® at a rate of 500ml per 50,000 Litres of pool water every 2-3 days. The required dosage of STARVER®should be added until you nish the container you have been supplied. Once you have completed the treatment, take a water sample to be tested for phosphates by your local pool professional. Once you have achieved the desired phosphate level (0-0.2 ppm) , a regular maintenance dose of STARVER® shouldbe applied. 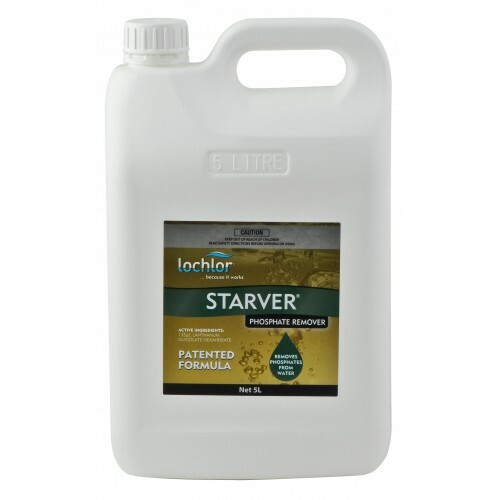 Add a regular maintenance dose of 500ml of STARVER® per 50,000 Litres pool water every 2 weeks. REGULAR PHOSPHATE CHECKS should be carried out by your local pool professional.